I have a PowerPoint presentation on bone divination that I give from time to time. 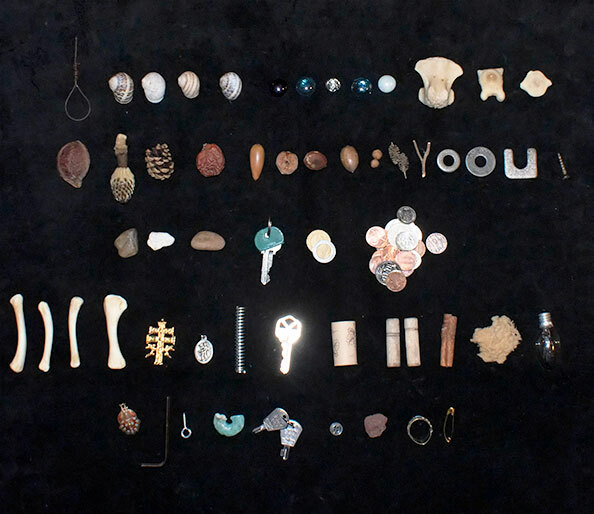 In it I have a bone set made from items found on my daily dog walks, and items that I found lying around the house. 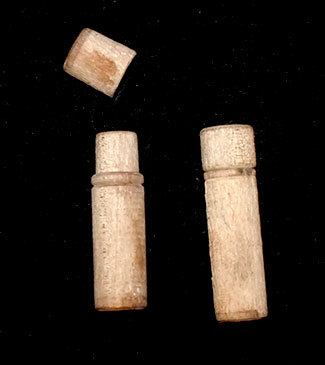 I use it to show what you can put together for free if you are willing to take the time to get outdoors into the fresh air and look around your home with an eye to what could be used as a divination piece. I live in an urban area. While a few of the items in this set came from city parks that are flush with trees and wildlife, most of the outdoor pieces were picked up from the street, curb, or edges of the front lawns I pass while walking my dog every day. Those pieces make up the first three rows of the photo. Snail shells come in a variety of colors and sizes. However, I have found that they often have thin spots that will crack over time. If you use them it may be wise to have a back up piece, and not be too upset if they should break. I am blessed to have many friends and acquaintances who gift me beautiful pieces, many one of a kind, as possible additions to my bone sets. I chose not to include any of them in this thrown together set. The things from my home were gathered on a quick look around my house for odds and ends. 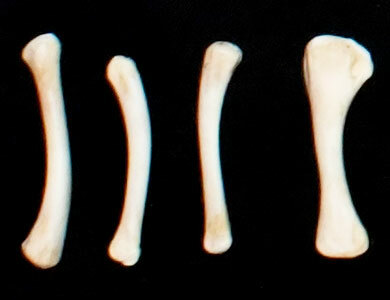 Chicken Wing Bones from Buffalo Wings. 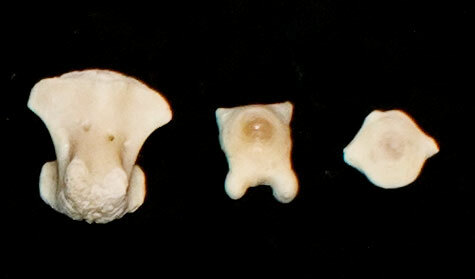 The first four bones are from a tasty dinner of buffalo style wings. I cleaned them myself and bleached them lightly with a weak hydrogen peroxide solution. I rarely cook a whole chicken, but if I wanted more bones I would do so and I would definitely salvage the wishbone. The next two rows are things I got from my home. These held pencil leads for mechanical pencils. I have thought of either painting them or covering them with beads. They open and could be used to store magical ingredients as well. $1.78 USD and 1.50 Mexican Pesos found while walking. Instead of costing money, this set made me money. 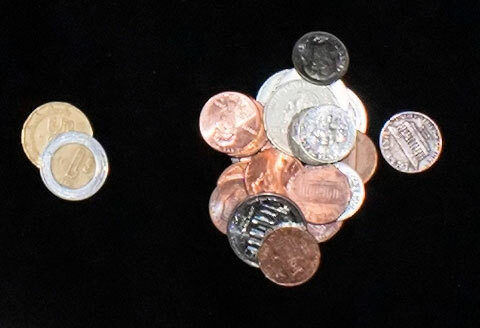 This is some of the change I have found on my walks. I live in Southern California – 15 miles from the US/Mexico border so finding Mexican coins is not unheard of. A wide assortment of seeds and pods. Most, if not all of these seeds and pods come from ornamental trees, plants, and shrubbery in the front yards of the homes I walk by each day. Twigs are also plentiful and are often different enough in color and texture to be easily distinguishable from one another in a set. Possibly an oxtail (cattle) bone found on the lawn of the common area in my subdivision. I found this bone stripped clean like this. I have also found small animal bones on the lake shore in a nearby trail park, but I always suspect that they are the remains of a picnic lunch. I come across dead animals fairly frequently on my walks, but I have yet to pick any up for personal use. They are rarely there again the next day as the city is good about picking them up, so they are not around long enough to decay down to the skeleton. This set has over 50 pieces and it cost me nothing but some time. It shows that you can put a decent set together without spending any money if you are willing to build your set slowly over time. It also shows that you can expand a basic or starter set very easily and inexpensively. Some stones and shells from the dollar store. A variety of shells and stones can expand your set easily. Not everyone lives near a body of water and the dollar store is less expensive than E-Bay and other online sources. 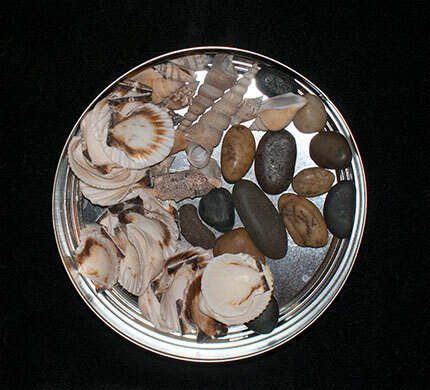 This tin holds the shells that were not broken from a bag of shells, and the stones that I found interesting from a bag of stones. If you are willing to spend a couple of dollars you can expand it even further with dollar store rocks and shells. This brought the net cost up to a little more than $0.40 with tax. This is the last post I will be doing for 2016. My next post will be in late January 2017. Happy Holidays and may the year 2017 be your best year ever!